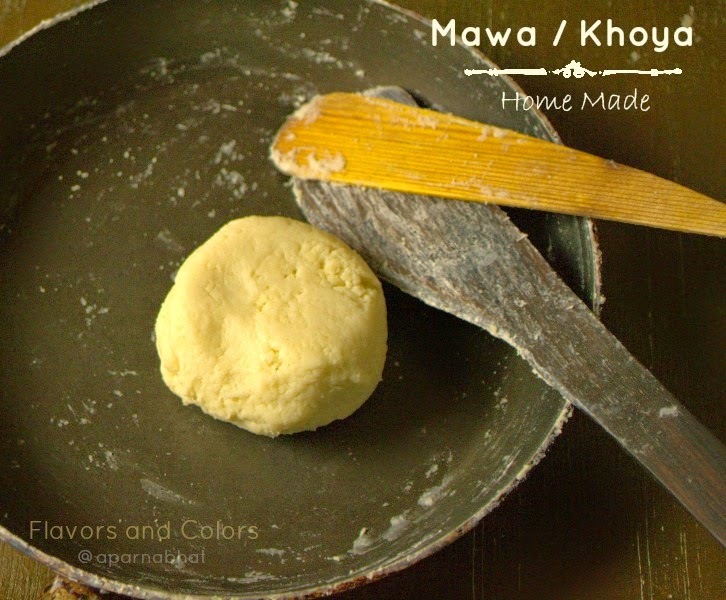 Many of the sweet preparations during Diwali includes khava/ mawa [milk solids] in its recipe. Usually we get this from stores selling mithais, and you may buy it as per your requirements bypassing this time consuming process. But home made stuff is altogether a different story and fresh taste is anytime better than store bought items. There are two methods one is stove top method and other one is microwave method. Below I am taking you through a step by step pictorial guide for stove top, a traditional way of making this at home. Please understand that this stove top method is time consuming, needs strong legs to stand in kitchen, patience to continue cooking on lowest flame and a bit attentive mind to stir in intervals. The yeild depends on water and fat content of the milk that is used for boiling. 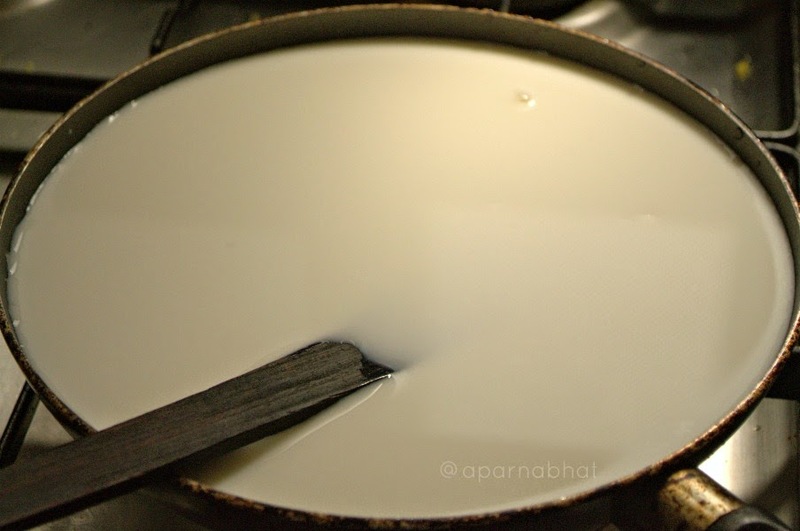 I used full fat milk and got 125 gms of khoya [around 3/4 cup] from 800 ml milk and the time it took was little more than two hours in this case where I used a small pan [Ideally you should take a deep non stick pan, but here with small pan I have tried to show levels of milk reducing with passing of time while boiling the milk]. Use a wider spatula. 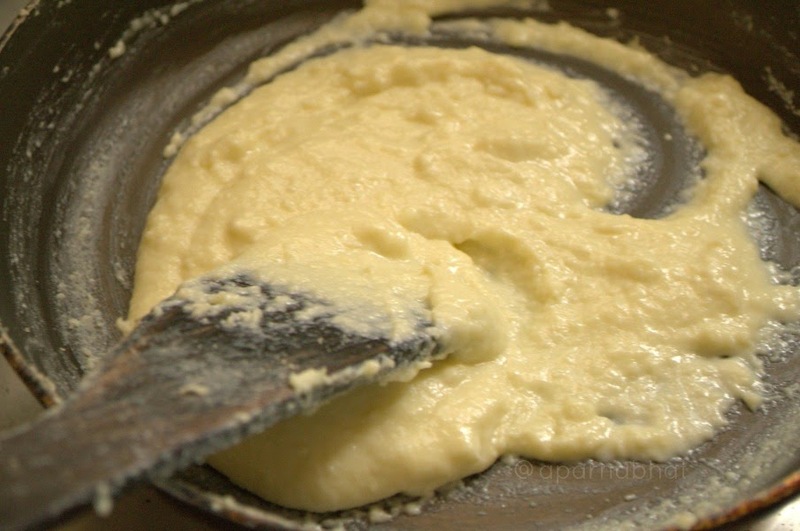 I used the small spatula just to scrape out the main spatula that was used to prepare milk solids. 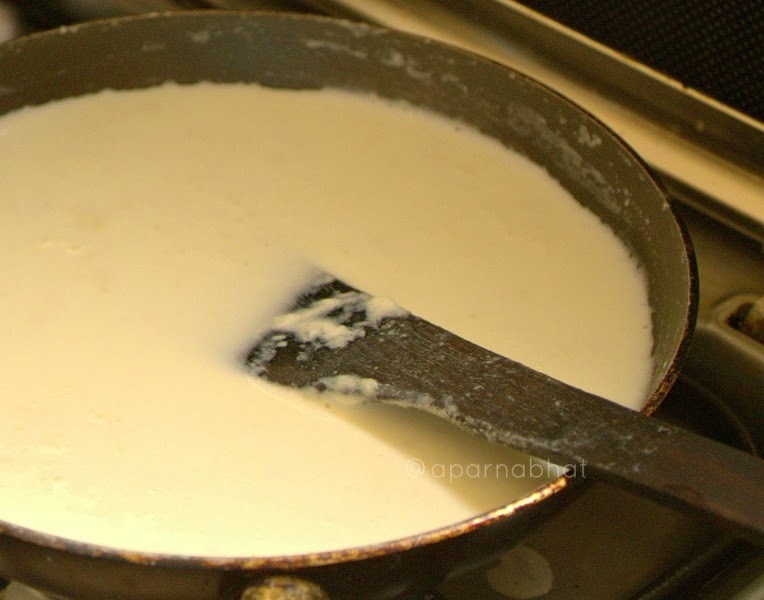 Pour the milk in a wide non stick pan or deep pan with heavy base. Allow the milk to heat and boil. Reduce the flame and continue cooking. 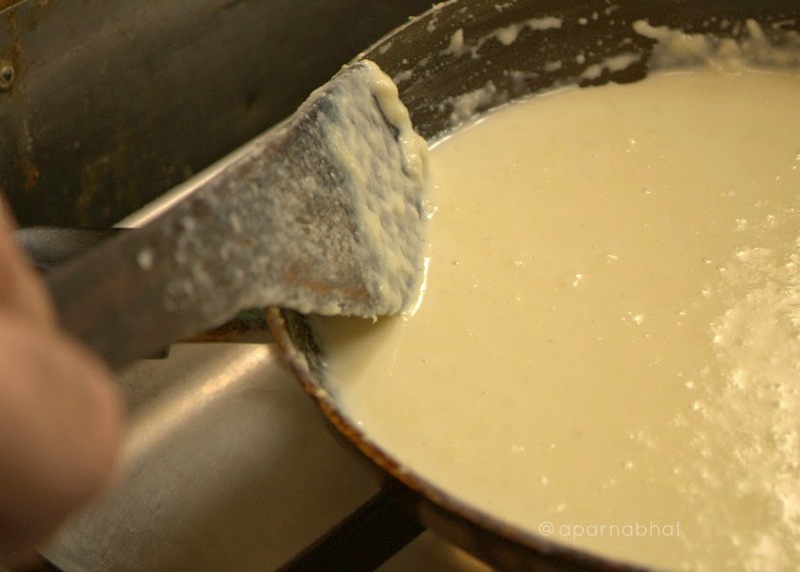 Stir in intervals so that it doesn't stick/burn to the base/sides of the pan. You can see in below pictures, the levels of milk reducing with passing of time. 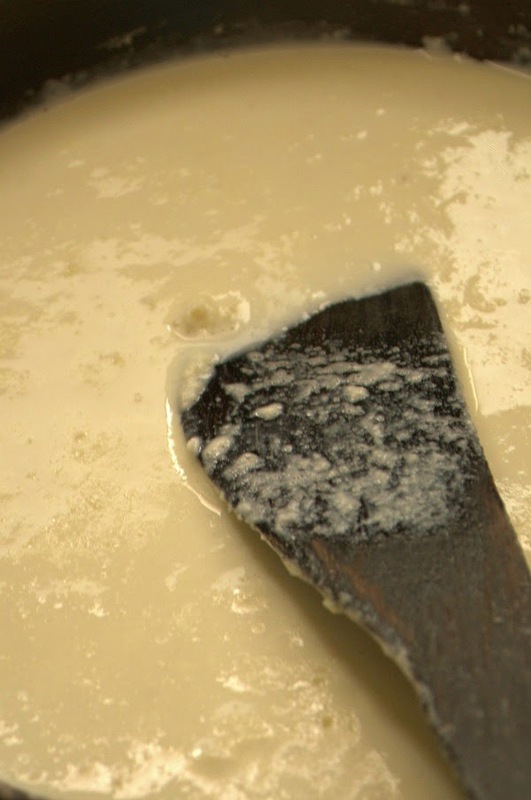 Milk thickens as you continue cooking. Now keep stirring continuously until the mixture thickens, leaves the sides of the pan and all the moisture is evaporated. 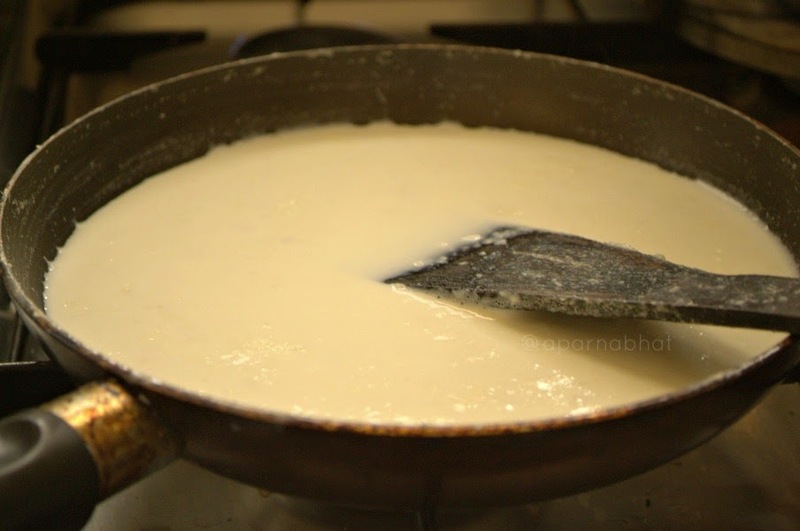 Below is what you get finally, Khava/ Khoyya/ Mawa been made on stove top method from fresh full fat milk. Refrigerate it. So now you know what's up next on Flavors and Colors ... :) yes its burfi having this khava/khoya in its preparation. very useful post Aparna,, thanks for sharing..